Meow! This kitty definitely gives me curious stirrings in my utility belt. 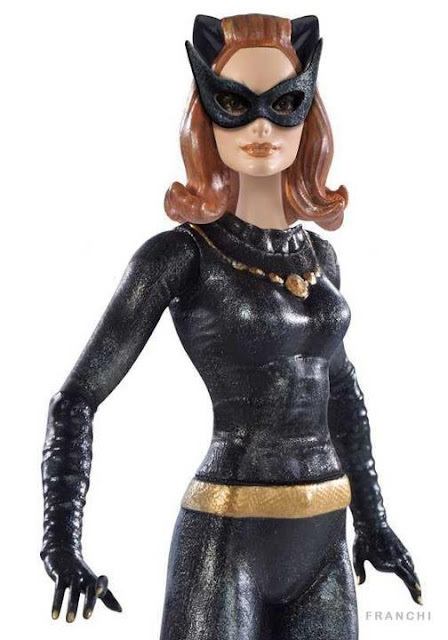 Mattel has finally released images of their Julie Newmar Catwoman action figure as part of their Batman TV series toy line. Catwoman was also portrayed by Eartha Kitt during the TV series third season and with Lee Meriwether also portraying the feline felon for the Batman movie. Julie Newmar originally was scheduled to continue her portrayal as Catwoman during the movie, but had to back out due to a back injury. Ms. Newmar's interpretation is definitely the most popular, but my favorite Catwoman from the series was Lee Meriwether and I am hoping if the toy line does well, Mattel will also produce all three versions of Catwoman. Other planned figures in this line are Batman, Robin, The Riddler, The Penguin, and The Joker with hopefully more to come. They are also releasing a 1966 Batmobile to go with them. Interesting fact: Suzanne Pleshette from The Bob Newhart Show was originally planned to play Catwoman before Julie Newmar. Not sure what happened in the end, but I do have a morbid fascination of what that would have been like. I think she was a a sultry looking lady at the time of the Batman TV Series. How do you feel about this new Catwoman action figure? Is line living up to expectations? For me, seeing them all lined up is awesome Hobby. Can't wait to line up mine the same way. She still doesn't top the Surfing Batman! Darn it. Right as always sir.